The shot which Rohit played was certainly not on at that moment. Rohit Sharma’s inclusion ahead of Hanuma Vihari in the first Test of the four-match series surprised many. Surely, their concern was understandable as the latter looked more assured in the practice game as well and was coming off confident knocks in New Zealand in the lead-up to the series. But Virat Kohli opted for more experience and attributed to Rohit’s ability to bat with the tail at the toss. Coming in to bat at 41/4 in the first session, India’s limited-overs vice-captain got off the blocks quickly and for a moment it felt that the decision to back him would work. Those crisp drives off the backfoot were back and he was also challenged to play a pull shot with the short ball. While he ducked under a few of those, Rohit also smashed one into the stands making a statement. Though the shot of the day has to be the lofted front foot drive over deep cover for a six off Pat Cummins which many could only dream to play. Rohit looked so subtle in his approach and swiftly went past the 35-run mark even as his partner Cheteshwar Pujara was adamant on holding one end up. In the 38th over, Rohit Sharma decided to take on Nathan Lyon and swept one in the air which just went past the ropes. Rather he was lucky to survive at that moment with the debutant Marcus Harris taking a clean catch but the momentum took him past the line as he failed to get rid of the ball in time. But, for some inexplicable reasons, Rohit came down the track off the very next delivery. Lyon smartly pulled his length back to cramp the batsman for room and Rohit went through with the shot in the same area. It was evident to the naked eye that he didn’t time it at all and Harris took the catch this time easily and didn’t have to move an inch at all. 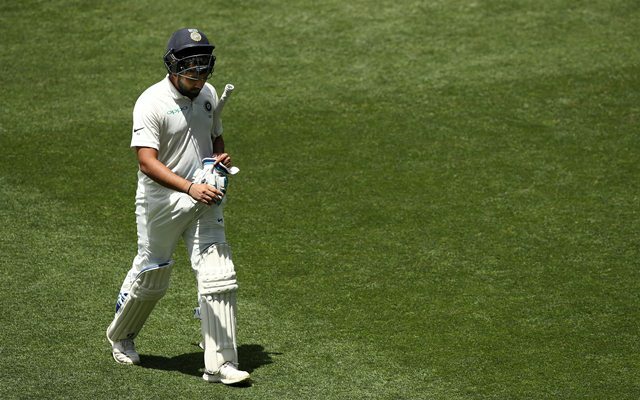 After batting so well for his 37 runs and almost had the opposition on the backfoot with a promising partnership building, Rohit Sharma once again threw away his wicket to leave his fans bewildered not for the first time in his “Test” career. Bhai set batsman getting out deserves more criticism ! Rohit Sharma just dismissed himself! A player playing as a pure batsman in a three day school level game wouldn't get out to such an ugly hoick! Let alone get out he wouldn't dare to play such a shot! Rohit Sharma, hahaha. My vote in 2019 is going to the party that puts in its manifesto – in writing – that Rohit Sharma will never wear India whites again. His worst shot ever in the most important test. Genius.